One of the big issues we speak with clients about is their children relationship with money. The Financial Planning Association of Australia (FPA) this year for Financial Planning week decided to focus its attention on this matter and has released some valuable information on this. The FPA conducted national research with The Curious Co. 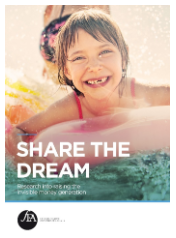 The Share the Dream national survey of 1,003 Australian parents of children aged 4-18, provides new insights into our nation’s financial capability and readiness to share the dream with the next generation. Did you know that two thirds of Aussie parents believe digital money is making it harder for children to grasp the value of money? Or that those who have sought advice from a financial planner have the most frequent money conversations with their kids and are most likely to believe their children are equipped for today’s digital money world? This 18-page report is a fascinating read and a great conversation starter with new clients, as well as existing clients. 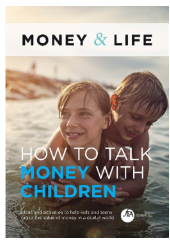 When you think about how much stress and heartache money and financial stress can cause, and the lack of financial education that exists nowadays, it would be a great gift to teach your children the important aspects of all things money related as soon as possible. If you need any further information please enter your details below. Thank you.